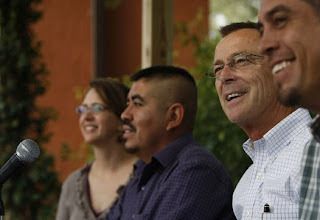 Last week, the Coalition of Immokalee Workers announced that they and "the Florida Tomato Growers Exchange (FTGE) have reached an agreement that will extend the CIW's Fair Food principles – including a strict code of conduct, a cooperative complaint resolution system, a participatory health and safety program, and a worker-to-worker education process – to over 90% of the Florida tomato industry." An article in the Atlantic points out "One penny a pound might not seem like a very big raise, but when you pick a ton of tomatoes a day, as a Florida farm worker can, one penny represents a raise from $50 to $70, the difference between poverty and a livable (though still paltry) wage. And it doesn't seem radical to suggest that growers should abide by a reasonable code of conduct that includes a mechanism to address complaints, a health and safety program, and training sessions." According to the CIW website, "The CIW is a community-based organization of mainly Latino, Mayan Indian and Haitian immigrants working in low-wage jobs throughout the state of Florida." The CIW began campaiging for workers' rights in 1993, taking on fast food giants like Taco Bell, McDonalds, and Burger King along the way. They also have an Anti-Slavery Campaign, which they describe as "a worker-based approach to eliminating modern-day slavery in the agricultural industry. The CIW helps fight this crime by uncovering, investigating, and assisting in the federal prosecution of slavery rings preying on hundreds of farmworkers."